This morning at 11 OCk. the hunters  arrived, having killed four Elk only. Labuish it seems was the only hunter who fell in with the Elk and having by some accedent lost the fore sight of his gun shot a great number of times but killed only the number mentioned. as the elk were scattered we sent two parties for them, they returned in the evening with four skins and the flesh of three Elk, that of one of them having become putrid from the liver and pluck  having been carelessly left in the animal all night. we were visited this afternoon by Delashshelwilt  a Chinnook Chief his wife and six women of his nation which the old baud his wife had brought for market. this was the same party that had communicated the venerial to so many of our party in November last, and of which they have finally recovered. I therefore gave the men a particular charge with rispect to them which they promised me to observe. late this evening we were also visited by Catel  a Clatsop man and his family. he brought a canoe and a Sea Otter Skin for sale neither of which we purchased this evening. The Clatsops who had brought a canoe for sale last evening left us early this morning.— Bratton still sick. There is a third speceis of brant  in the neighbourhood of this place which is about the size and much the form of the pided brant. they weight about 8½ lbs. the wings are not as long nor so pointed as those of the common pided brant. the following is a likeness of it's head and beak. 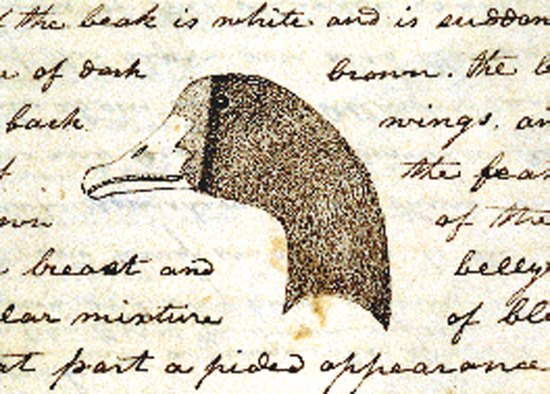 a little distance around the base of the beak is white and is suddonly succeeded by a narrow line of dark brown. the ballance of the neck, head, back, wings, and tail all except the tips of the feathers are of the bluish brown of the common wild goose. the breast and belly are white with an irregular mixture of black feathers which give that part a pided appearance. from the legs back underneath the tail, and arond the junction of the same with the body above, the feathers are white. the tail is composed of 18 feathers; the longest of which are in the center and measure 6 Inches with the barrel of the quill; those sides of the tail are something shorter and bend with their extremeties inwards towards the center of the tail. the extremities of these feathers are white. the beak is of a light flesh colour. the legs and feet which do not differ in structure from those of the goose or brant of the other speceis, are of an orrange yellow colour. the eye is small; the iris is a dark yellowish brown, and pupil black. the note of this brant is much that of the common pided brant from which in fact they are not to be distinguished at a distance, but they certainly are a distinct speis of brant. the flesh of this fowl is as good as that of the common pided brant. they not remain here during the winter in such numbers as the white brant do, tho' they have now returned in considerable quantities. first saw them below tide-water. There is a third Species of Brant in the neighbourhood of this place which is about the Size and much the form of the bided brant. they weigh about 8½ lbs. the wings are not as long nor So pointed as the Common pided brant. 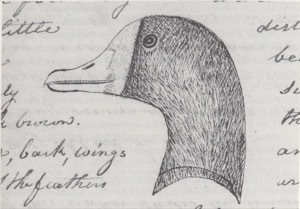 the following is a likeness of its head and beak. a little distance arround the base of the beak is white and is Suddenly Suceeded by a narrow line of dark brown. 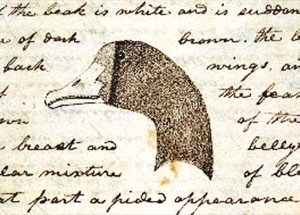 the ballance of the neck, head, back, wings and tail all except the tips of the feathers are of the blueish brown of the Common wild goose, the breast and belly are white with an irregular mixture of black feathers which give that part a pided appearance. from the legs back underneath the tail, and around the junction of the Same with the body above, the feathers are white. the tail is composed of 18 feathers; the longest of which are in the center and measure 6 inches with the barrel of the quill; those on the Side of the tail are Something Shorter and bend with their extremities inwards towards the center of the tail. the extremities of these feathers are white. the beak is of a light flesh colour. the legs and feet which do not differ in Structure from those of the Goose or brant of the other Species, are of an orrange yellow Colour. the eye is Small; the iris is of a dark yellowish brown, and puple black. the note of this brant is much that of the common pided brant from which in fact they are not to be distinguished at a distance, but they Certainly are a distinct Species of brant. the flesh of this fowl is as good as that of the Common pided brant. they do not remain here dureing the winter in Such numbers as the white brant do, tho' they have now returned in Considerable quantities. we first met with this brant on tide water. The Clams of this coast are very Small. the Shells consist of two valves which open with a hinge, the Shell is Smooth thin and of an oval form or like that of the Common Muscle and of a Skye blue colour; it is of every Size under a Inch & ¾ in length, and hangs in clusters to the moss of the rocks, the nativs Sometimes eate them.— The Periwinkle both of the river and Ocian are Similar to those found in the Same Situation on the Atlantic.— there is also an Animal which inhabits a Shell perfectly circular about 3 inches in diameetor, thin and entire on the marjin, convex and Smooth on the upper Side, plain on the under part and covered with a number of minute Capillary fibers by means of which it attaches itself to the Sides of the rocks. the Shell is thin and Consists of one valve. a Small circular opperture is formed in the Center of the under Shell the Animal is Soft and boneless &c.—. Saturday 15th. There was a fine plesant morning. About noon our hunters came in and had killed four elk. A number of the natives came to the fort today. Saturday March 15th A pleasant morning, the Indians remained at the fort during the last night. they seem not inclined to part with their Canoe this morning, Our Officers sent Six Men  in a Canoe in order to go up the River to the Cath-le-mah Village, in order to purchase a Canoe if possible. Our hunters that went out Yesterday returned to the fort. they had killed 4 Elk. a number of the Men went from the fort and brought in the Meat of the 4 Elk to the fort. In the afternoon a number of the Chin-ook Nation of Indians— came to the fort. The Cath-le-mah Village  is situated on the So Side of the Columbia River 45 Miles above fort Clatsop it contained 105 Lodges & about 1500 Inhabitants & are a band of the Flatt head nation.